Whether your community college serves a large rural community, a small town, or a diverse urban center, our customizable content library draws attention to all the ways your program leads to student success. EDUCATE, ENGAGE, AND INSPIRE THROUGH QUALITY-DRIVEN CONTENT. Content marketing is the most relevant, enduring, and cost-effective way to grow enrollment for community colleges. 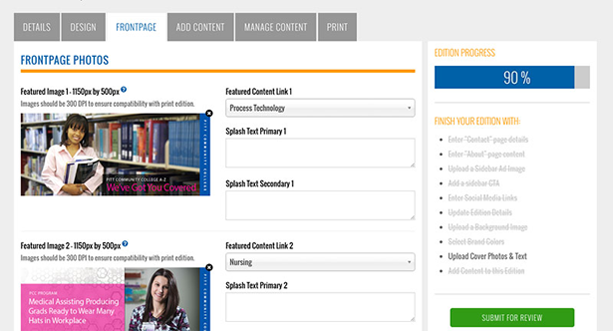 Build your marketing campaign using articles from our content library, then distribute through print and digital channels. CarerFocus is a time-tested product used by community colleges across the country to build the link between professional training and improved careers. 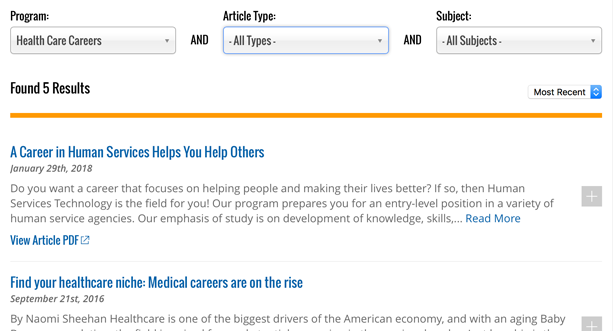 Customize content to reflect your community college and share your message. SmartStart is designed to connect with Generation Z— the largest college-attending generation. Based on extensive research, the design of SmartStart reflects their preferences, including more images, infographics, and short, punchy articles. What’s your demographic? Our CampaignBuilder can help you get there. Our campaigns have primarily been used by community colleges to increase enrollment, but their uses don’t stop there. Any locally-based organization that could benefit from collaborative content services can benefit from our platform. Contact us to learn more about our services.